Living with arthritis is no fun – especially if you’re a feline. It can be limiting and painful, but we as pet parents can help. Since there is no cure for arthritis, early detection and diagnosis are key when coming up with an effective medical treatment that will help treat the pain and maintain your cat’s quality of life. How do you know if your cat has arthritis? Keep an eye out for these arthritic behaviors. If your cat has cerebellar hypoplasia, odds are you’re already hyper-aware to normal and abnormal movements and behaviors, which can help if you suspect your cat is suffering from joint pain. Take notes on how your cat’s behavior has changed; these notes may be useful to your vet. If you think your cat may be suffering from arthritis, set up an appointment to see your vet. He will be able to provide a proper diagnosis, and will be able to come up with a treatment is that is specifically designed for your cat’s needs. Some treatment options may include anti-inflammatory/pain medications, moderate exercise, weight control, nutritional supplements to help replenish cartilage, and sometimes even surgery. 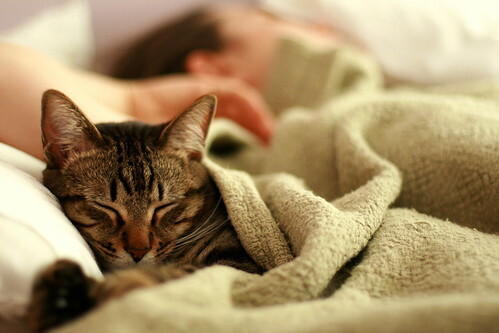 Medications: Your vet will be able to prescribe the proper drug(s) and dosage for your cat, which will ease her pain. Do not give your cat human pain killers like Tylenol, aspirin or Ibuprofen unless specifically directed by your vet, as these products can be toxic to your pet. Moderate Exercise: While this may seem counter-productive, moderate exercise will help your cat strengthen her muscles, keep tendons and ligaments flexible and help blood circulate. Speak to your vet to find out how much exercise is right for your pet, as you don’t want to overdo it. Weight Control: If your cat is overweight, your vet may suggest feeding your cat a light or low-calorie food. Losing weight can help reduce the strain on your cat’s joints. Make your cat’s life as simple and easy as possible. Watch how your cat gets around, and think about what actions in his daily life may be giving her trouble. Feeding Station: Make sure that your cat’s food and water bowls are easily accessible. You may event want to elevate them. There are a few products out there that may help. Litter Box: You may want to purchase a larger box with a lower entry for your cat, so it’s easy for her to get in and out of it. If you can’t find one with a low enough entry, you may want to consider making your own litter box. Also place the litter box close to where your cat spends most of her time. For example, if your cat spends most of her days sunning in the living room or your bedroom, don’t put the litter box in the basement. Favorite Places: Use a pet ramp or stairs to help your cat get to his favorite places like your bed, the couch, and his favorite perch. There are many options you can buy online; some folks have even made their own. Cat Bed: Consider pampering your cat by upgrading her bed to something that’s a bit more cushy. Similarly, placing your cat’s bed in a warm spot can help ease her pain. You may also want to consider purchasing a heated bed. Help Her Out: Even with treatment, your cat may not be able to do all of the things she used to. Keep this in mind and try to help her out as much as possible. For example, gently comb/groom the areas of her body that she can no longer reach. Even if she’s not a big fan of being combed, she’ll appreciate it. Do you have any other recommendations? Please share in the comments! One of my clients takes her cat for acupuncture and has seen great results with it.